Recently I had a problem upgrading the iLO firmware on one of our servers through the GUI. This particular server did not have an OS on it at the time so normally I would update through the web interface. However since the firmware on this machine would not work with IE 11 I had no choice but to upgrade through SSH. Before you start copy your firmware file (ilo2_225.bin in my case) to a local web server and make note of the URL. Login to the iLO with your favorite SSH client. Now type the following command replacing the URL with your own URL. The update will now begin. It can take up to 10 minutes for the process to complete. You will be disconnected from your session during the upgrade. Login to iLO again and type “version” to verify the update has been completed. Resetting an HP iLO2 using SSH or Telnet isn’t the most obvious thing to do. Recently I had one where the web interface wasn’t responding and I didn’t want to power down the server to reset iLO. Connect to the iLO IP address using your favorite SSH client. I prefer Putty. Login with your Administrator account. Don’t forget bother username and password are case sensitive. The type reset. The iLO card will restart immediately after that. Not too long the decision was made to move to HP laptops from our old vendor. I was tasked with making sure our existing MDT environment could support the HP laptops (8460p and 2560p). Drivers were relatively easy but I did run into some issues with the HP Hotkey Support buttons. These are the buttons that control volume, screen brightness, mute etc. The SoftPaq from HP consists of both drivers and an application all wrapped up in a single installer. My first attempt was to extract the drivers and then import them into the MDT database. This worked and the drivers installed during setup and I have no yellow bangs in device manager. However only some of the hotkeys worked. My next attempt was to keep the drivers loaded in the MDT database and I would run a silent install after Windows was installed to install the supporting application to control the keys. The installer is MSI based so I thought this would be easy. Make the application default in MDT based on these specific manufacturer and models and I would be golden. Clean, simple, and automated. After mucking about with the MSI and included MST files I was able to get it to silently install but it never would load the application. The install would complete successfully but it refused to install the application. I even ripped the drivers out of the MDT database and I still had the same issue. If I ran it non silently it would install correctly but this was hardly ideal. I knew there had to be a way of doing this in some kind of automated fashion. HP deploys these laptops by the thousands. I doubt they pay anyone to sit there and click next all day for this. After doing some more research I found the HP SSM and SDM tools. 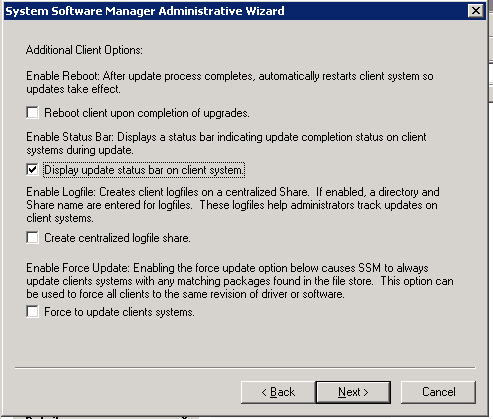 HP System Software Manager make it super easy to deploy Softpaqs to one or multiple machines. In order to deploy a Softpaq through SSM it needs to be marked as SSM compliant. Most of them are but every once in a while you run into one that isn’t. 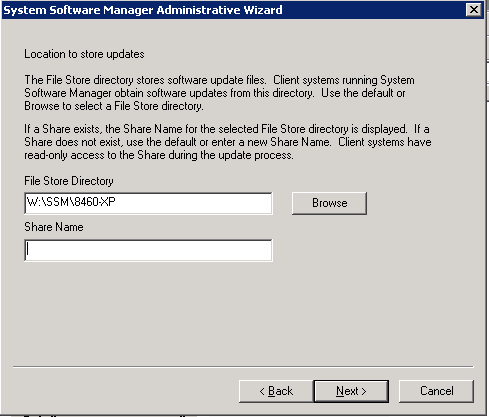 First I downloaded the HP SDM and installed it on my MDT management server along with SSM. I used the SDM tool to download the Softpaq for the HP Hotkeys. You could use this for other Softpaqs but I am just going to focus on the Hotkeys for now. Then I created a subfolder on my MDT server and copied the SSM.exe and SSM.bin files into this subfolder. You should create a share on this subfolder so you can access SSM from any other PC. Next I created a subfolder for the HP Hotkeys Softpaq and copied it into the subfolder. If you are going to deploy multiple Softpaqs I recommend creating a folder for each Softpaq. Now run the SSM.exe file and accept the agreement. Click next on the welcome screen and you will be asked for the file store directory. Set it to the subfolder you created to hold all your Softpaqs. If you are going to deploy multiple Softpaqs make sure you set it to the root subfolder. SSM will read each subfolder in the directory structure for Softpaqs. If you did not share this folder before you can let SSM do it for you. Personally I like to control what gets shared on my server so I did it manually. Click Next and then click next again to confirm. You can set various client options on the next screen. I like to display a status bar while the update is installing. Once you set your options click next. If you are deploying a BIOS with SSM you are REQUIRED to set a password. Check the box if applicable and click next. Click Next on the summary screen. Finally click the Build Database button to build the SSM database. This will create 2 MDB files that SSM will use to install the Softpaqs. Click Finish to save your changes. You now have a complete package that you can call from MDT to install the Sofpaqs silently. Now that we have this package how can we use it from MDT? That’s the easy part. SSM has a command line mode that you can use to call it from MDT and install the Softpaqs silently. /RB – reboot after the updates complete. Set your command line options as necessary. In my package I had no password and did not want to reboot so I just used /A. Now when deploying your image select this newly created application. After MDT finishes installing Windows the Softpaq will be added along with any other applications you may have chosen. In my MDT setup I went one step further and used a Make and Model query to automatically assign any HP Elitebook 8460p or 2560p this Softpaq. This ensures that each time these model laptops are imaged they will receive this application without worrying if the tech forgot to assign it.